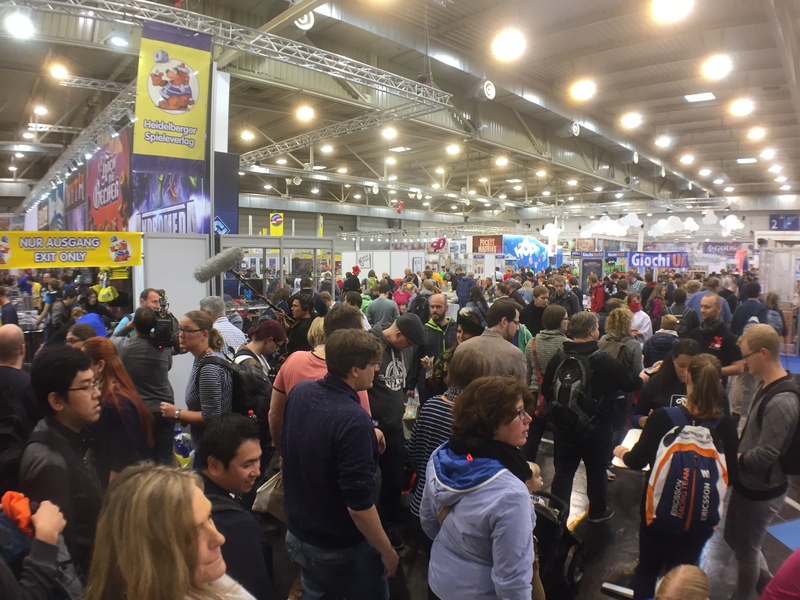 My second time to Essen and I had a blast! It was just lucky happenstance that I was even able to go this year (my second time ever to Essen). My wife and I are having twins and we decided to have ourselves a little baby-moon. My wife chose Belgium, which didn’t excite me too much, but when I asked when she wanted to go and she said early October…well then, I think I’m interested now! Thursday night we met up with Andreas from Zoch, his wife, Gil Hova, and Al Leduc for dinner! Nice to catch up with them since Andreas missed the Gathering this year. Friday was my first day there and it was very casual and relaxed. It was the first time my wife had ever been to a game convention as she’s not much of a gamer. I got to show her the giant Junk Art display which was so impressive. I can honestly say that I think that no other game had as much floor space dedicated to it than Junk Art. They had 8 giant versions of the game being demoed and it was super busy all day long! Next up we visited Horrible Games because a former student of mine, Frederico was working there. Apparently he actually changed his life after attending my class on board game design (which is part of the video game design program at the Vancouver Film School). He decided that he liked board games too much and he’d rather find a job in that industry…and he did! So proud of him! And happy that I influenced someone in that way. 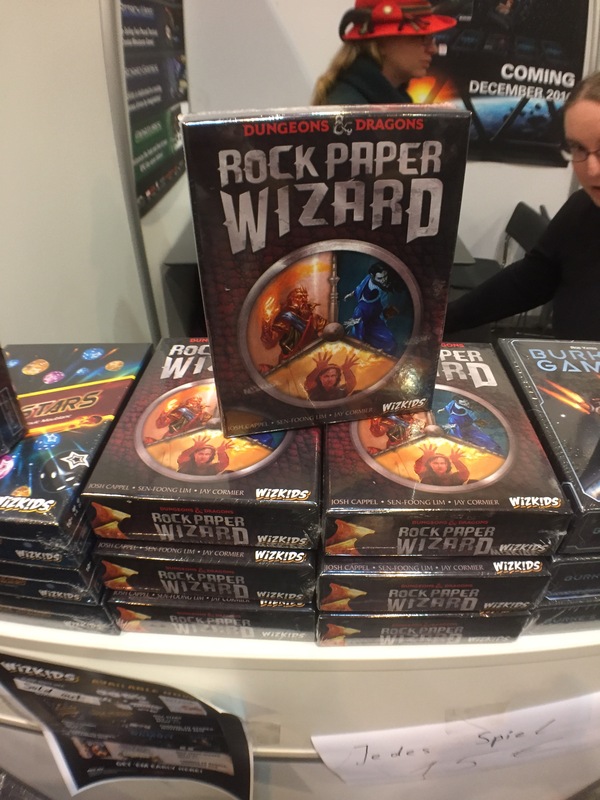 We also got to see D&D: Rock Paper Wizard from Wizkids! It was the first time I saw the box and it’s a beauty! I buckled and had to buy one. They were down to 40 units from the 120 that they brought. I also found out that the game should hit stores in December instead of January like the original press release said. Zev also said that there were other publishers interested in translating it into other languages for other countries….sweet! The rest of the day was spent leisurely walking around, and introducing my wife to a few publishers that I know. We ended the day with me being interviewed by CBC radio for a future podcast. Saturday my wife hung out with a friend who was also in town and they went shopping while I went back to the Messe! 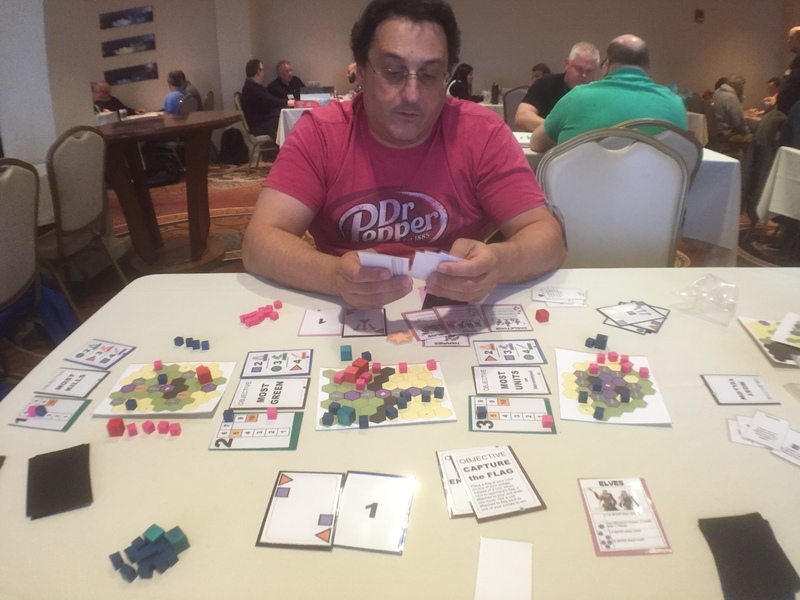 I demoed Rock Paper Wizard for an hour and then bumped into Scott from Renegade Games who confirmed our game, Pig Goes Moo should be coming out in the third quarter of next year. He also confirmed that he played SimpliCITY and said he liked the gameplay but would want a better thematic hook if he were to pick it up. We’ve got some ideas. Like many publishers, HUCH! and Friends had small meeting rooms behind their booth. Secret doors!! Next I was off to HUCH! and Friends for my first pitch of the day. I first confirmed that Aladdin was indeed happening and everything is on track there. She also indicated that they’re closer to making our game, Herdables happen as well! They’ve been trying to figure out the right material for the tokens and they think they’ve figured it out. I then was able to pitch her the new and improved Law of the Jungle, which she had seen twice before in other iterations. We played a full game of it and she agreed that it was the best version of the game so far. She was interested in taking it with her but I had some other publishers to pitch it to first. 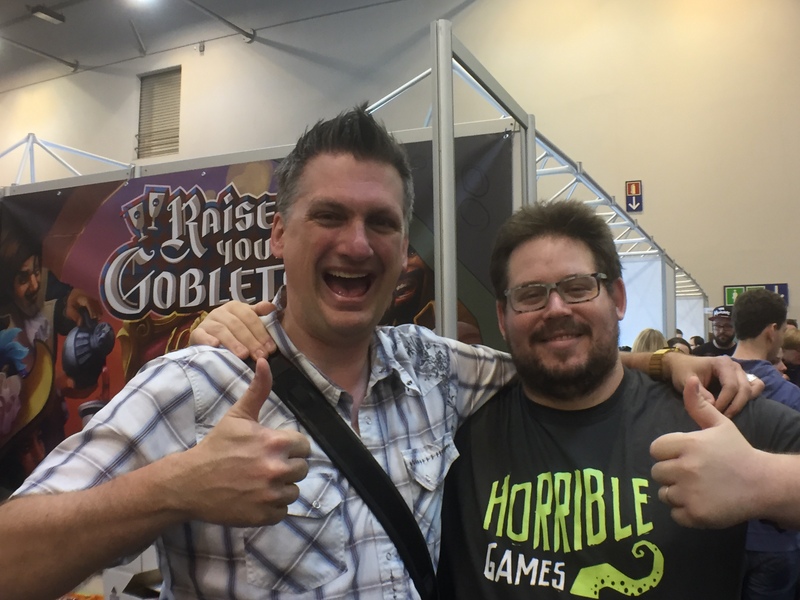 When that was done I met up with my friend and co-designer on a couple of games, Shad Miller! He took the train in from Switzerland just so we could hang out for the day! We started walking around and I saw the Matagot booth and I said I’d like to see if I could find Stefan Brunelle who works there. As I started to look for him, he found me! He was sitting right there and asked us to join him at the table. I introduced him to Shad and he introduced us to Mathieu. Stefan asked if we had anything to pitch because Mathieu was the main guy to pitch to at Matagot. Well, how lucky is that? So we got out Skirmishes and played a full game with Mathieu and another person who was brought over to help translate since my French isn’t that good and his English isn’t great either! The demo was amazing with Mathieu edging out a victory! He had some feedback about a possible positive feedback loop but overall he really liked it and wanted to take it back with him! Huzzah! We had enough time for me to pitch Law of the Jungle as well and while we didn’t have time to play a full game, he liked what he saw and wanted to take a look at that game too! Sweet! Again we had to take the games with us to pitch to others but we told him that we could come back later and drop it off. Up next was a pitch session with Mayday Games. We showed them Skirmishes and Law of the Jungle and they too liked both of them! They said we could simply email the the PnP files since they could easily print a copy for themselves. Wow – five for five! After that Shad and I just walked all over and met all sorts of publishers and designers. Shad said it was like being on a reality TV show! It seemed like 10 minutes wouldn’t go by without us bumping into someone I knew! 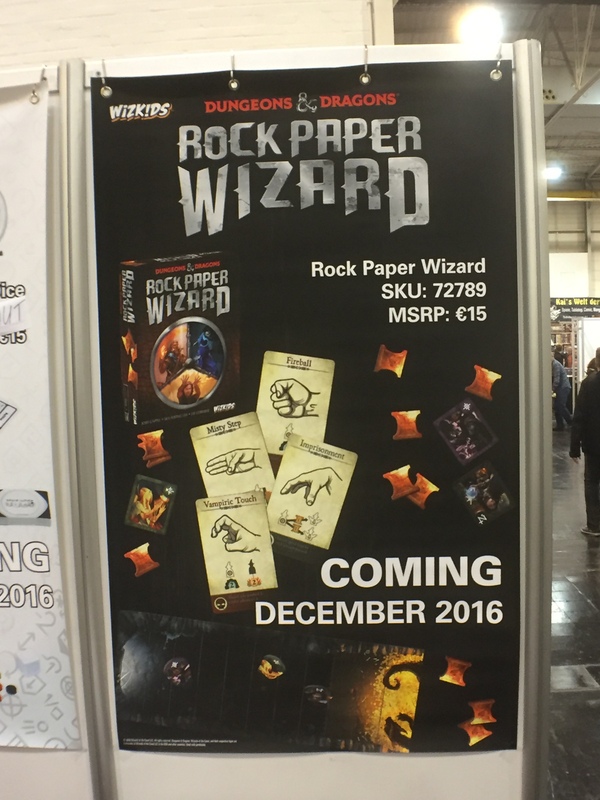 The owner of Horrible Games wanted to meet me because he really loved Rock Paper Wizard and he invited me to pitch him games in the future! Nice! At the end of the day we decided to leave both games with Matagot since Mayday will print their own and I can mail a copy of Law of the Jungle to HUCH! That night we all went out for dinner and then Sunday we left. It was a bit of a whirlwind experience and I loved every moment of it! The Gathering of Friends is always my favourite week of the year (ok, with the exception of the week I got married this year! ), and this year was as fun and productive as usual. Here’s a summary of the shenanigans that the Bamboozle Brothers got up to over the last 10 days. We pitched fewer games than usual this year, mostly because we’ve been busy working on licensed games. We still managed to meet with a bunch of publishers. 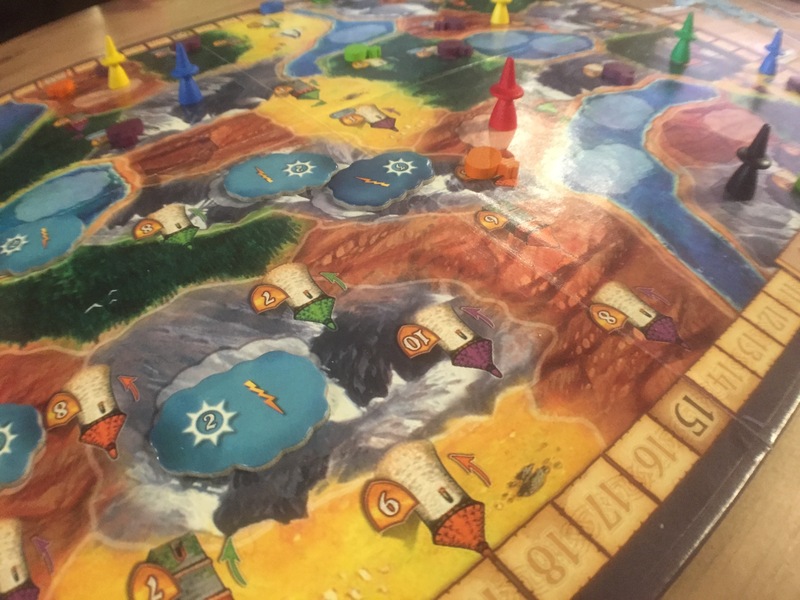 Filosofia: We showed them 9 Thieves and a set of three games set in the Arabian Nights stories, each designed by different designers. They liked 9 Thieves and gave us an idea to improve it, which we did for our next pitch. 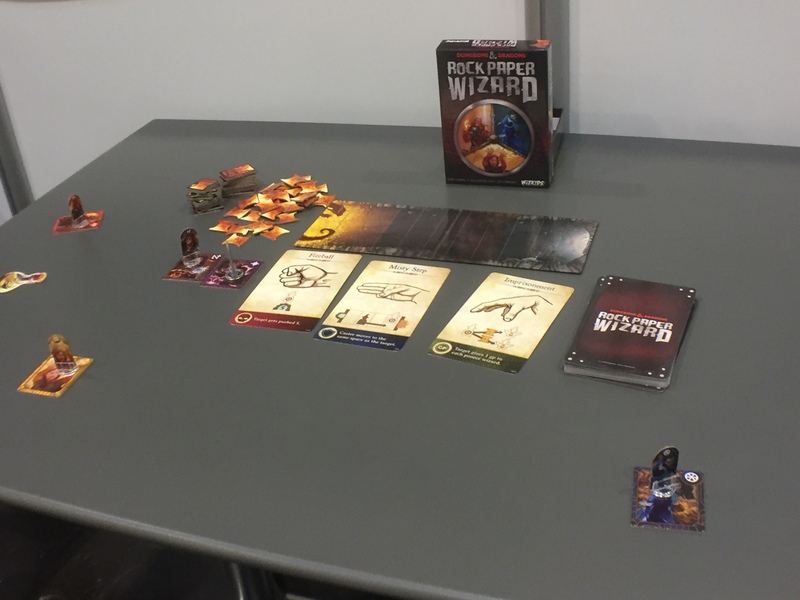 Wizkids: Right before the Gathering a contract expired for Rock, Paper, Wizards, a game that another publisher had of ours, which meant that it was back on the market. Zev from Wizkids remembered liking it last year, so after a round of playing the game again Zev wanted the game! He had an idea that seemed like it would break the game, but the underlining issue he was trying to solve was a valid issue. 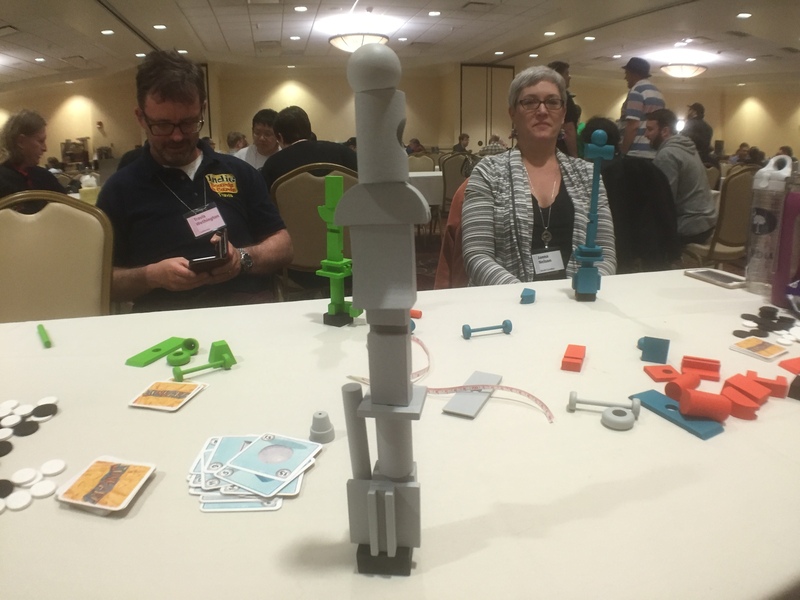 This was a game we co-designed with Josh Cappel (yes, THAT Josh Cappel – the artist for Belfort!) and Josh had a brainstorm that solved the issue even better and made everyone happy! Huzzah! I also pitched to Zev a game I designed with non-Sen designer, Shad Miller, called Skirmishes. He really liked that one and asked to have a copy to evaluate. Zev from Wizkids examines Skirmishes! 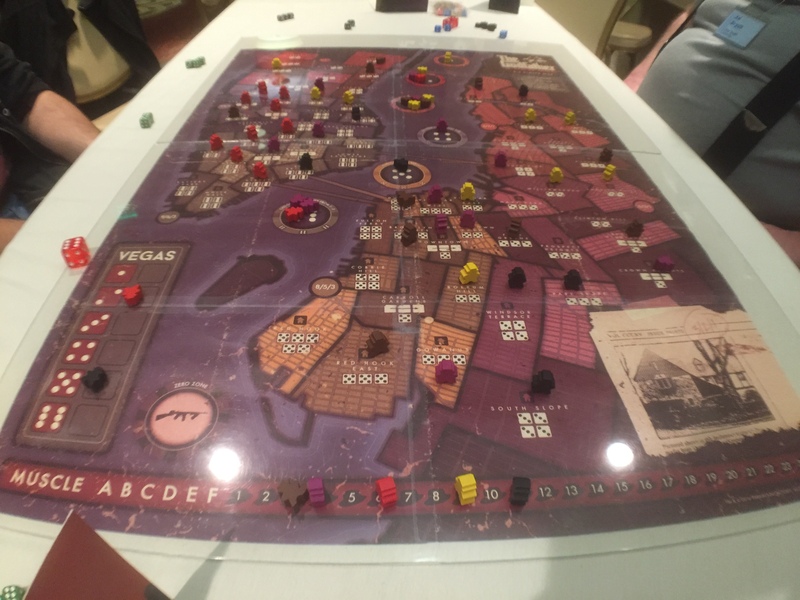 Stronghold: I showed Stephen Skirmishes because I thought it was something he’d be interested in – and he liked it and said it was very clever, but he already had a battle game coming out this year. USA-opoly: I wouldn’t have thought to pitch anything to him based on the games that they’ve made. I had the fortune of sitting beside Tony from USA-opoly on a 2 hour bus ride to Toronto to visit Snakes and Lattes and see the Blue Jays game. Seems like they are trying to publish their own games and the timing is perfect! I showed him some games and he seemed intrigued, but none of our current games seemed to match what he was looking for. Huch & Friends: I always enjoy pitching to Britta and Benjamin as they are very nice, fun and professional. They are also the fastest publishers to respond to an email in my experience so far! We showed them our games and she ended up liking two of the Arabian Nights games, one of them being our Aladdin game. Yay! 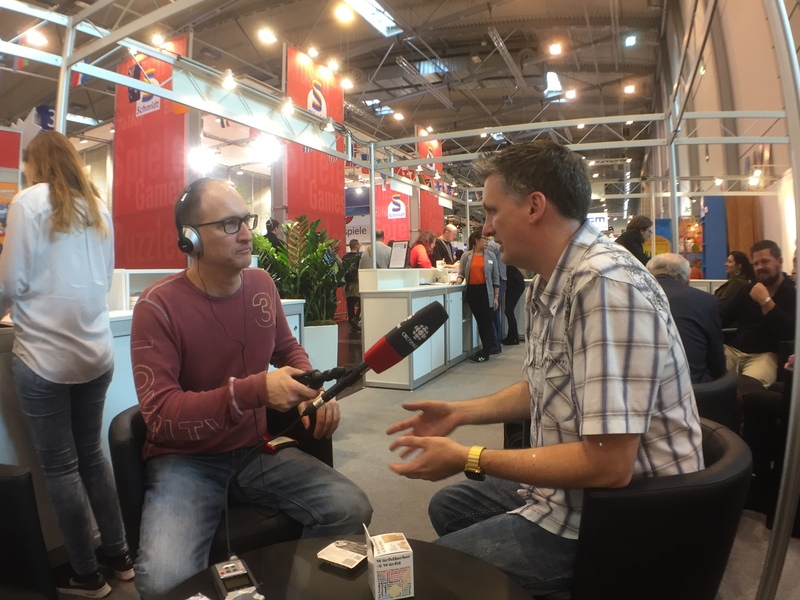 They have also had our Herdables game for a coulee years and think they might want to publish that one too…so fingers crossed! North Star: it was more of a lengthy conversation than a pitch as we chatted about where they’re at and where they want to go with their business. It was great to learn where they’re going and what they’re looking for in the near future. Could turn Into something exciting! 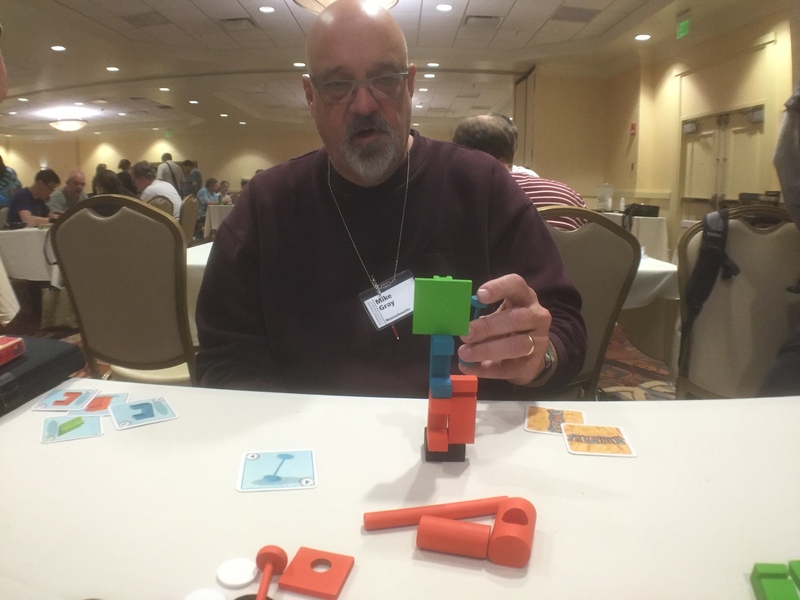 Pretzel Games: Well this is a first – we pitched a game to a publisher that we never play tested. Not only that, but we didn’t even have a prototype! Whaaa? We were told by Martin that he was looking for some outdoor games, so Sen and I came up with an idea for an outdoor game, but we didn’t want to put time and resources into making the game if the concept wasn’t even interesting to Martin. After our pitch we brainstormed some more on some production challenges and he ended up liking it and wanted us to proceed to the prototype stage! Sweet. Matagot: Stefan is pretty new with Matagot so he is still trying to understand what they’re looking for, but he liked Skirmishes and wants me to take a picture of the game fully set up so he can show it to his team. 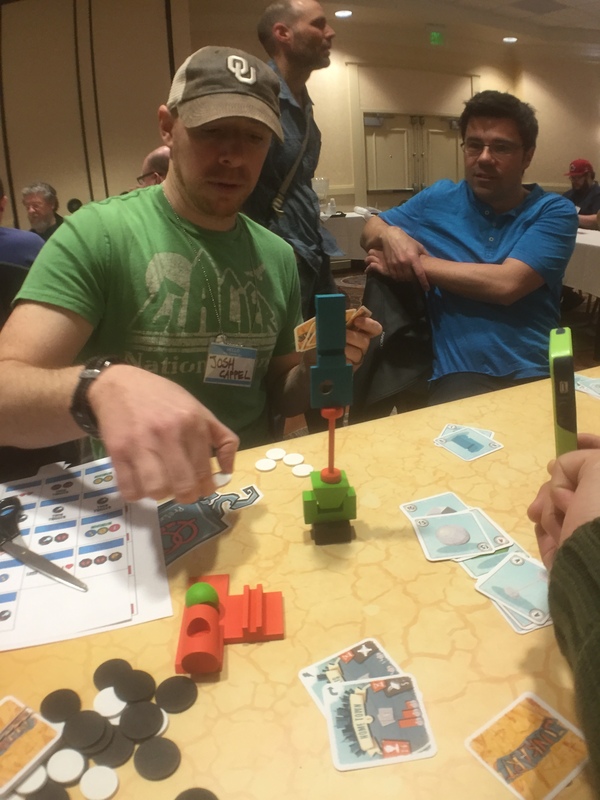 Indie Card and Board: This was an impromptu pitch when I saw Travis walking around, not looking busy. He had seen me playing/pitching our word game, Chainables in a restaurant with Tony from USA-opoly and had commented that it looked cool. I figured that it wasn’t the kind of game that Indie would publish but thought he’d like to play a game. He did, and enjoyed the game (not to publish it tho! ), and then I transitioned that into a pitch for 9 Thieves. He seemed to like it and gave us a couple of great ideas to tweak it. So yay for improvements at least. 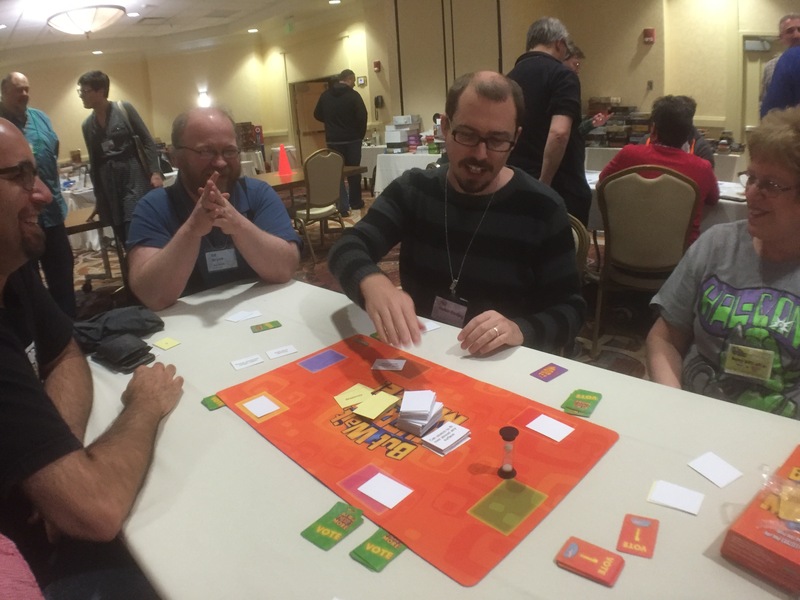 Sen and I had 2 games that we were asked to help promote while at the Gathering this year, Junk Art and Godfather: A New Don. Junk Art is the second game from Pretzel Games, with the first being the hit from last year, Flick ‘Em Up. Junk Art involves 15 wooden pieces in 4 different colours for a total of 60 wooden pieces. There’s a deck of cards with each piece having its own card. There are many ways to play the game, but mostly you’re challenging players with cards to place those pieces onto their own base, trying to get points for placement or for having the tallest structure. 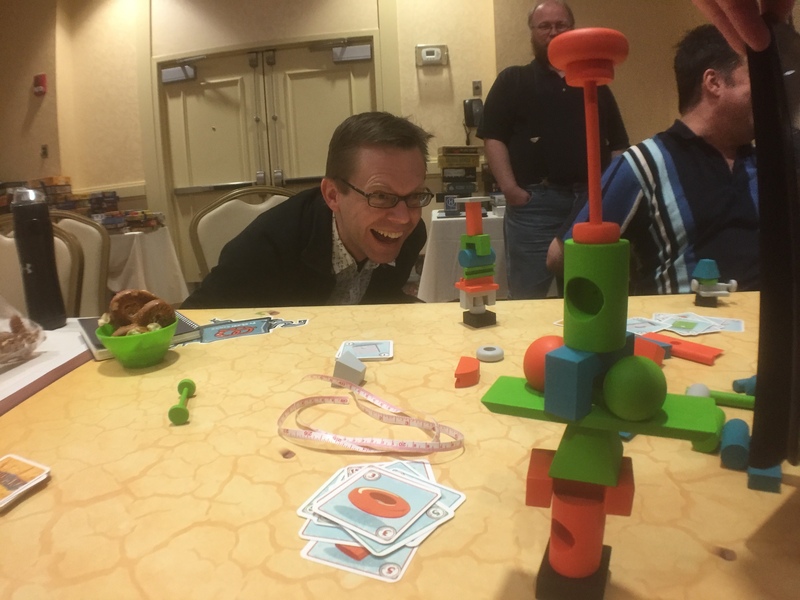 Matt Leacock (designer of Pandemic and Forbidden Island) is amazed by his own creation! 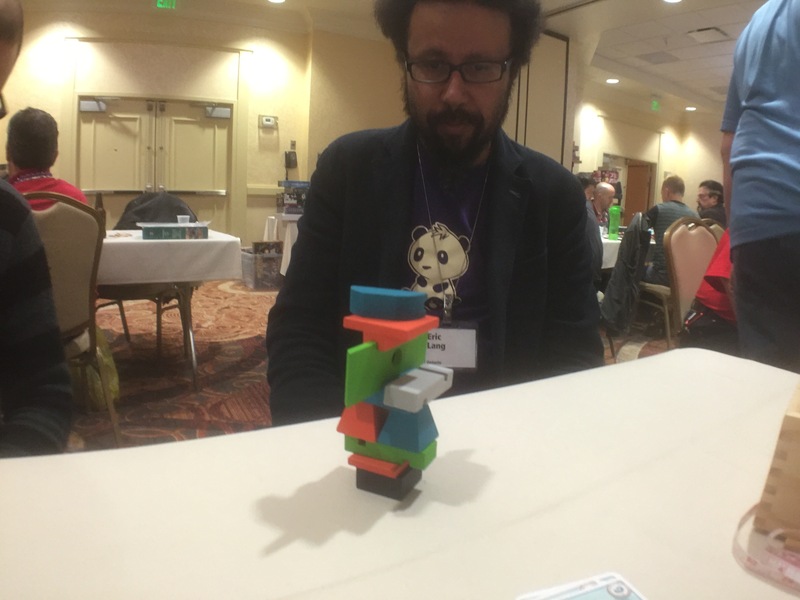 Willaim Attia (designer of Callus and Spyrium) trying Junk Art! Josh Cappel (designer of Wasabi and artist for Belfort) trying some outlandish moves. Some great reactions after a piece is added to a structure! They’re playing the Montreal variant which has players inheriting the structure that they were just passing cards to in the previous round. This mode causes the most insane structures! Travis from Indie Card & Board calling to order his own copy of Junk Art (I can only assume that’s what he was doing). This mode was called Gujarat where each player takes all the pieces of one colour. Eric Lang staring contemplatively at his winning structure while playing the Monaco variant. Phil Walker-Harding is trying to compete for tallest structure in the Home Town variant. This is considered to be the main game and has a lot of strategy! Mike Gray – the man who brought Bausack to America and called it Bandu, plays Junk Art! 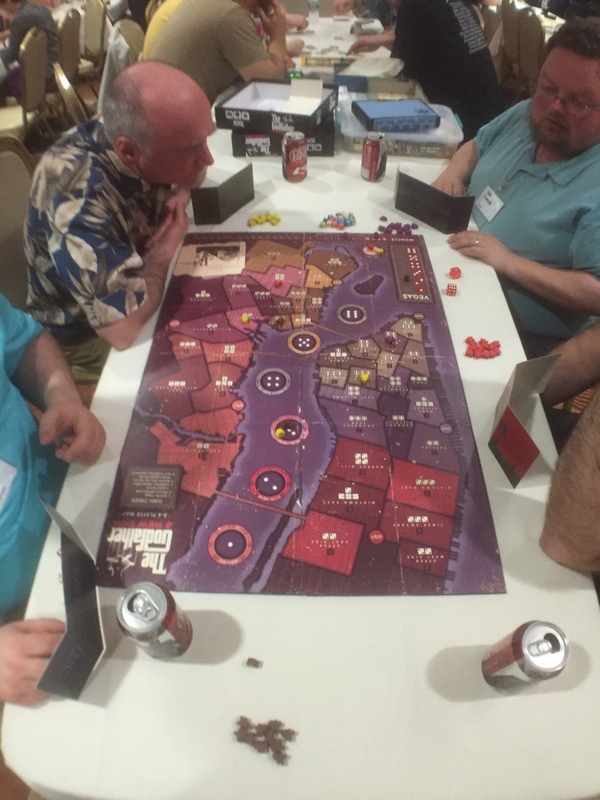 Godfather: A New Don is published by IDW Games and was air shipped to the Gathering. It was a final art prototype, meaning that the quality of the components were not final (and some pieces were hijacked from other games!). I got to get this game played at least 4 times during the con and everyone seemed to really like how streamlined the game is. If you like dice rolling and area majority, then we have a game for you! Add to the mix that players have to offer dice to the Godfather every round, the ability to muscle other players out of your neighbourhood and the fact that you can invest in Vegas and you’ll find it pretty difficult to not talk like mafia and quote the movie while you play it! 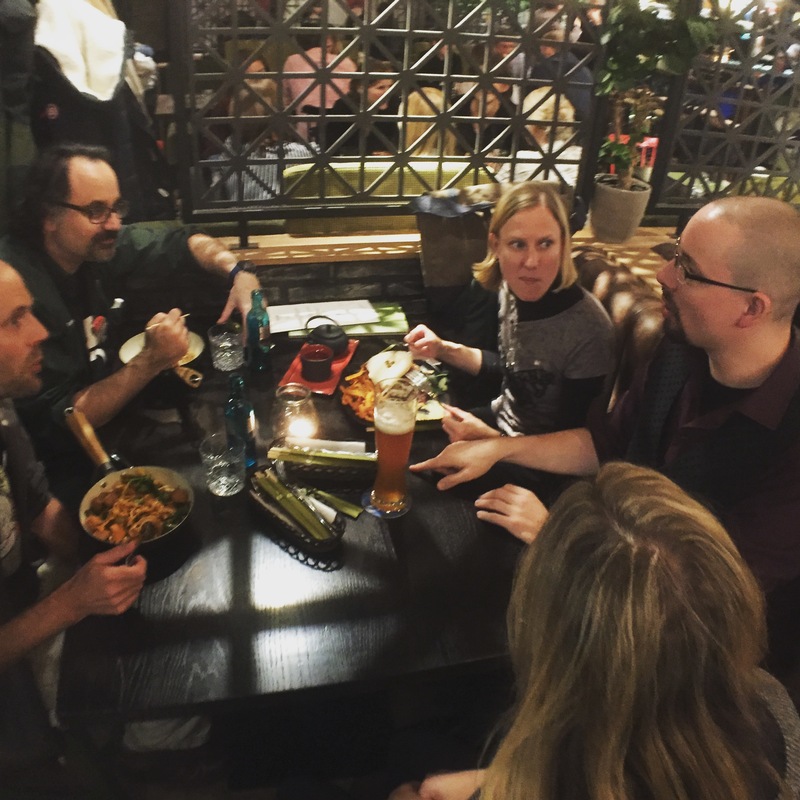 We spent some time not pitching – but business stuff! 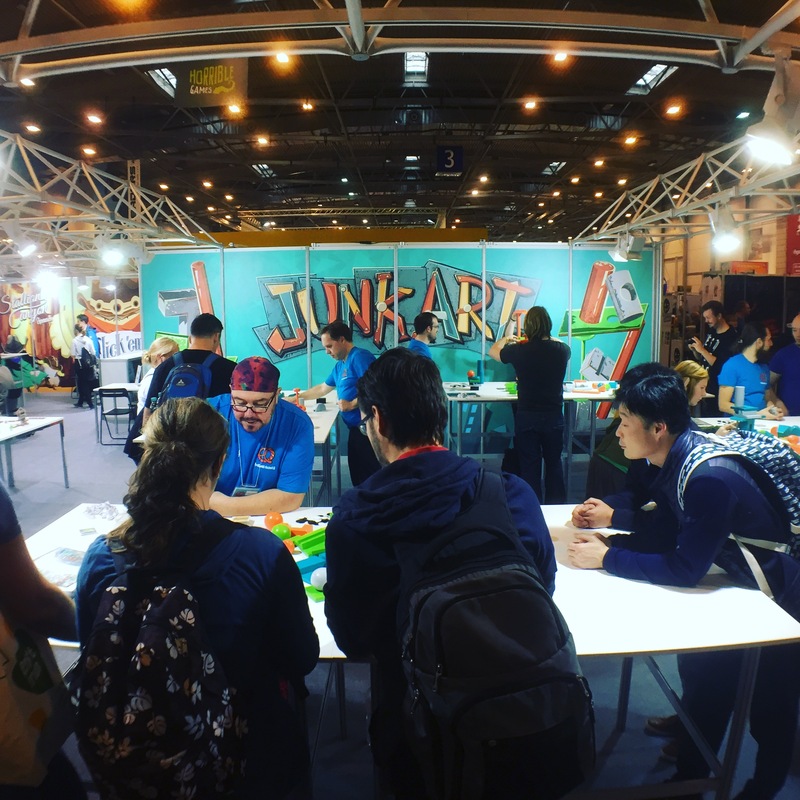 We spent a couple hours at least with Martin from Pretzel Games discussing and brainstorming the first expansion to Junk Art. The game isn’t out yet but they believe in it so much that they want to have an expansion ready ASAP. It was maybe my favourite part of the whole week as 2 designers and a publisher brainstormed through game play and publishing challenges to figure out how to make our cool ideas come to life. Needless to say, we’re pretty excited about it! We had a lunch meeting with Mercury Games and talked about the two games of ours that they have in the pipeline, Zombie Slam and What’s That. Both require an app to play the game, and they have recently hired an app developer (another Game Artisan of Canada!). So we talked through the timing as well as the future of Mercury. 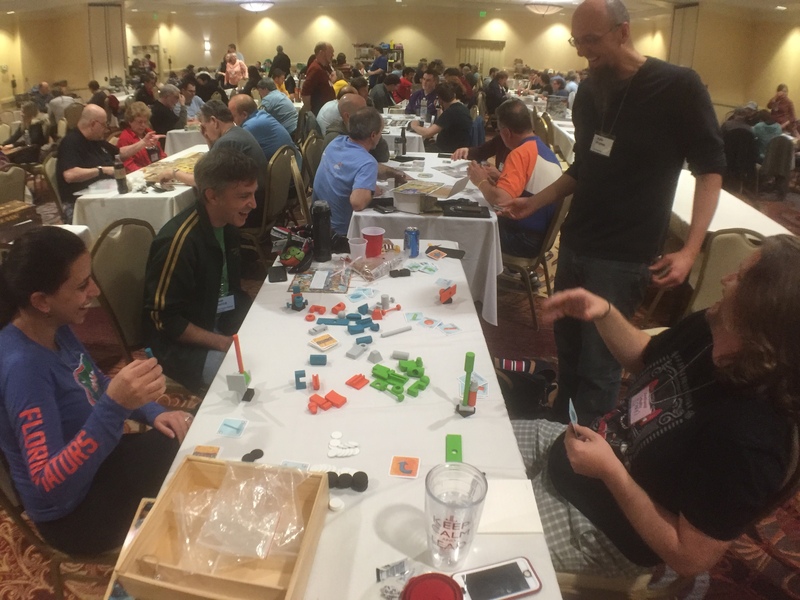 We wanted to get a lot of play testing of our games with other people done at the Gathering – and we did! 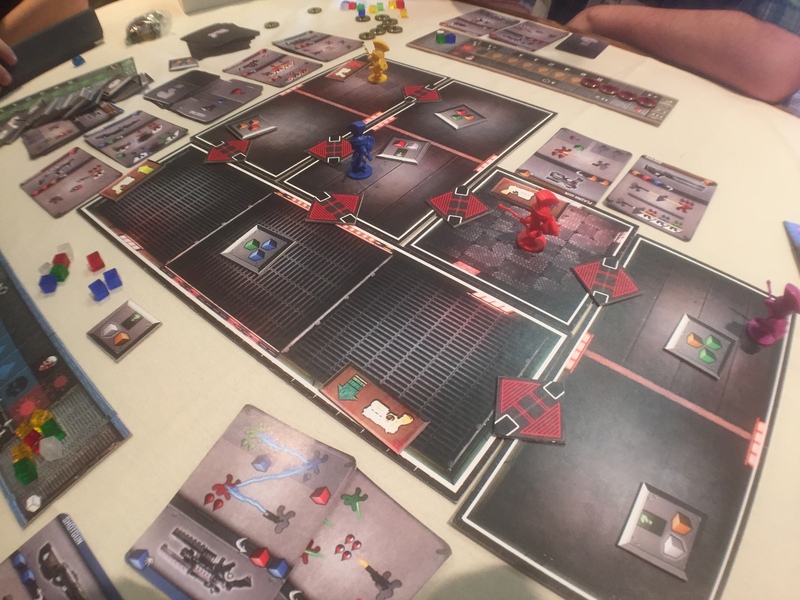 Powers (a game based on the comic, coming out later this year form IDW Games) was played twice. The first game had Matt Leacock as a player but the game broke down and made us realize the importance of the set up. We got some great feedback though and we tweaked it for another playtest later in the week. The second test was better but still messy. We have ideas on how to clean it up and continue simplifying while still ensuring there’s a challenge for players who’ve played it a bunch. Godzilla (a game coming out from Toy Vault) was played numerous times, and three times by me. All the games were great, but it’s obvious that the Godzilla deck is not well constructed, so we have to change which cards are in the deck. Easy fix! Skirmishes (by Shad and me) got played by Sen and me before we left for the Gathering and it made me change one big thing in the game that makes the game easier to comprehend the first time playing. But Wait There’s Even More (a game from Toy Vault). The first print run has sold out, but instead of just reprinting, we’re thinking of printing a new box, full of 100% new content. This way, existing fans can buy it – but newcomers can buy it as well! We tested all the new phrases and got to tweak a few of them as well as a new rule for this edition! Phil Walker-Harding (designer of Sushi Go and Cacao) pitches some crazy product to the rest of us! 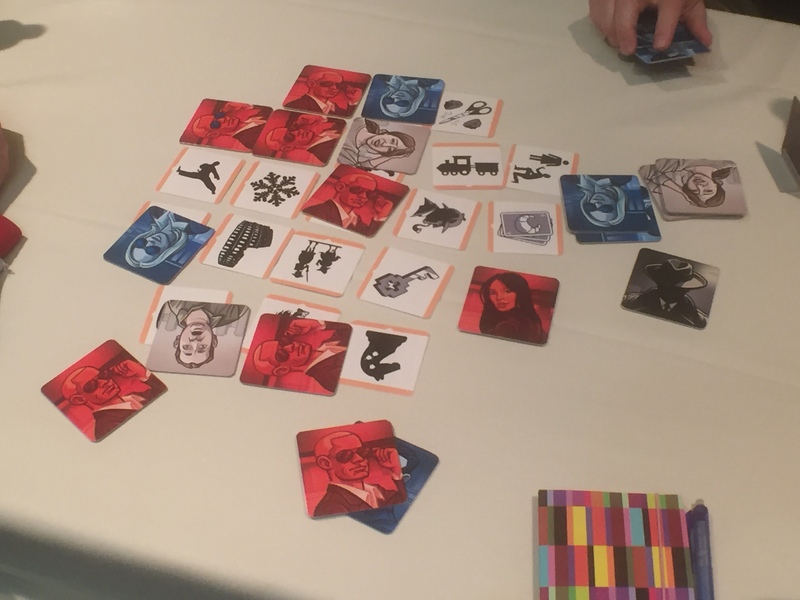 I got to playtest other designers’ games as well, like Matt Leacock’s new family co-op game, Mike Kolross’s G-Men, Phil Walker-Harding’s Spy Craft, Mike Gray’s Water God, Josh Cappel’s Dead Run, Al Leduc’s Dogs on the Bed, and probably a few more that I can’t recall. I did find some time to play some games as well while I was there! Codenames Pictures: This was a no-brainer. Take the hit party game Codenames, but replace the words with images. The images are all kind of weird too – which makes it interesting. This will play better when you have friends that have different native languages. 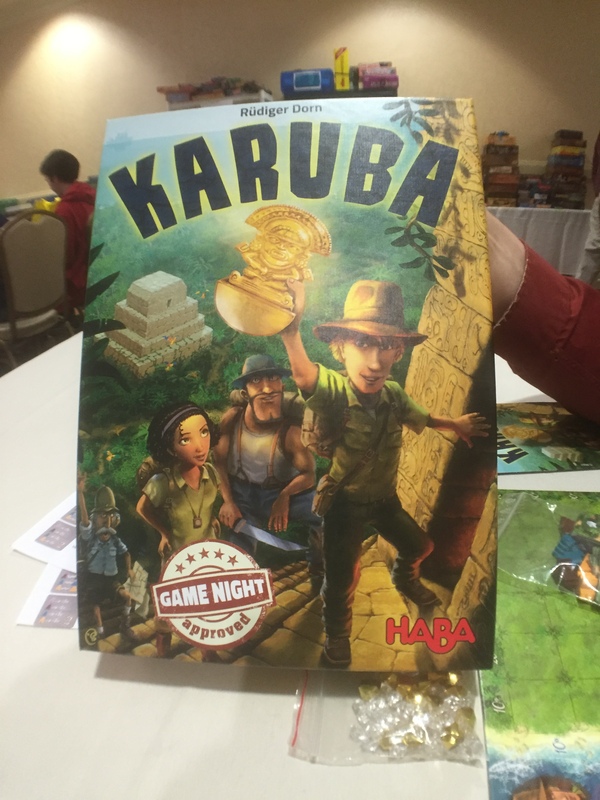 Karuba: a fun and light game that’s like Take it Easy with a theme. Played this one a couple times. Team Play: a nice light partner based card game where each player has a goal of the cards they need to collect in order to score points. Players can draw cards as well as pass cards to their partner. Pretty fun and easy. 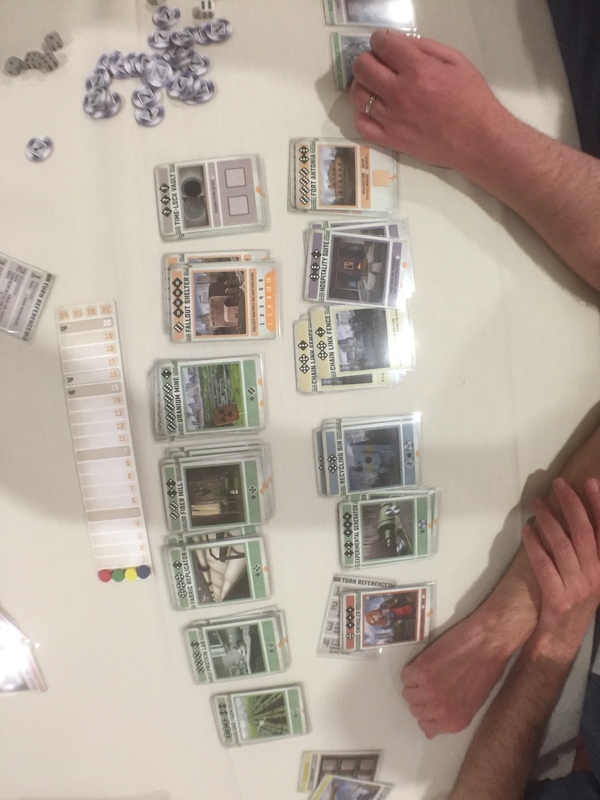 Colony: Kind of like Machi Koro but has a bit too much downtime between turns. I heard it’s great with 2 players – and it would probably get better with repeat plays. 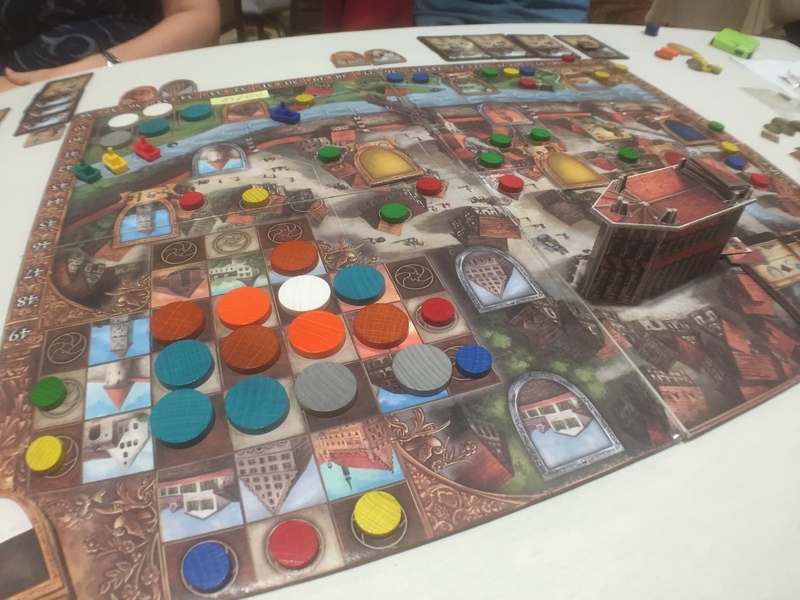 Ulm: I played this last year as well, and it should be coming out this year from Huch & Friends. I really like it and look forward to playing it again. 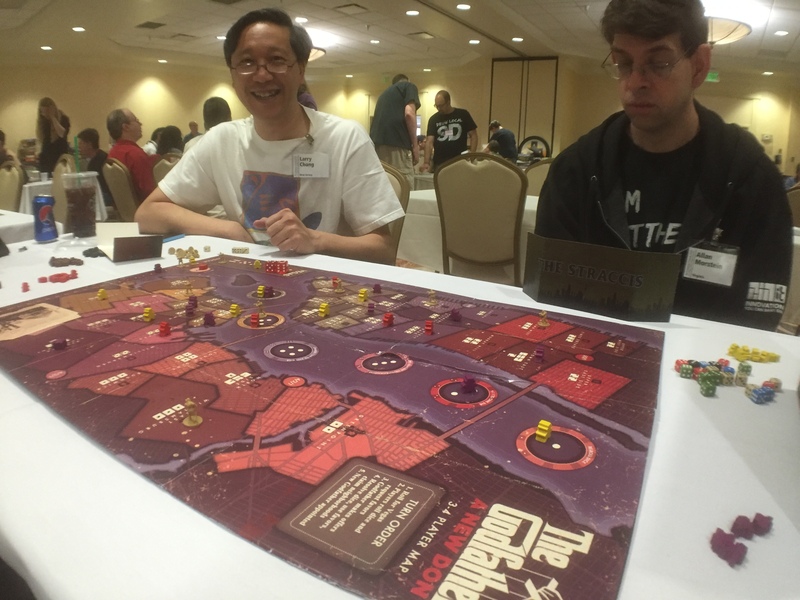 Tichu: I partnered up with Stefan Brunelle and we beat Zev and Ignacy’s wife, Merry. Love this game. Strike: Weird that this is a published game…it’s just a bunch of dice and a plastic mold inside the box that you roll them in. Super random obviously but fun for 4 minutes I guess. Rollers: this one was a fun game but it just lasted way too long for us. We thought it was over but then we realized that it’s the player to get 5 points first…so the game continued. Adrenaline: A cool PvP game that emulates a first person shooter in tight quarters – but it does so with no dice rolling. It has a bit AP, but I thought it was very neat! 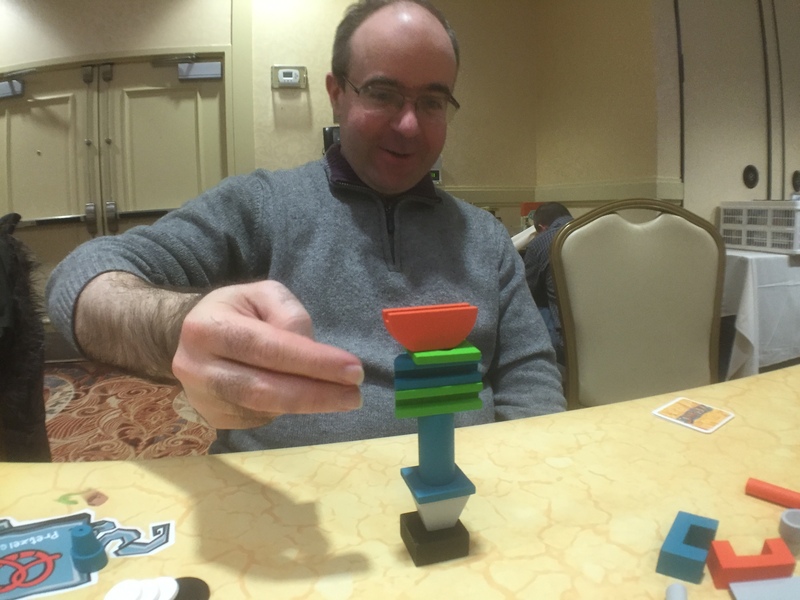 Wonky: a neat idea for a small balancing game. Not sure how much replayability it would have though. Broom Service: a neat idea about being cowardly or brave…though it can be punishing. Sen and I didn’t have as much time as we thought we would, mostly because he had to leave for 4 days in the middle to go back to work. Boo! But we ironed out quite a few things in the car ride there and back at least! 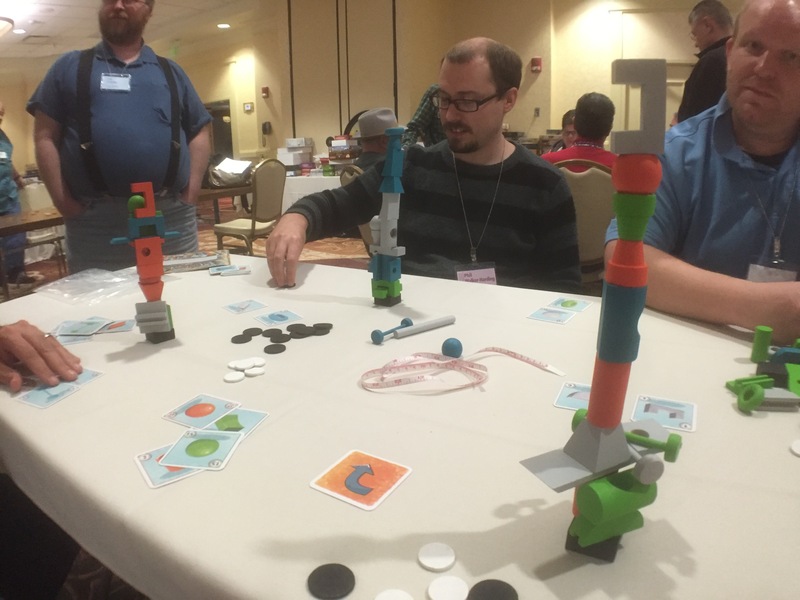 Josh Cappel had an idea for a game while at the Gathering and asked me for help trying to turn it into a game. We made some good progress on it and we’ll continue working on it together. 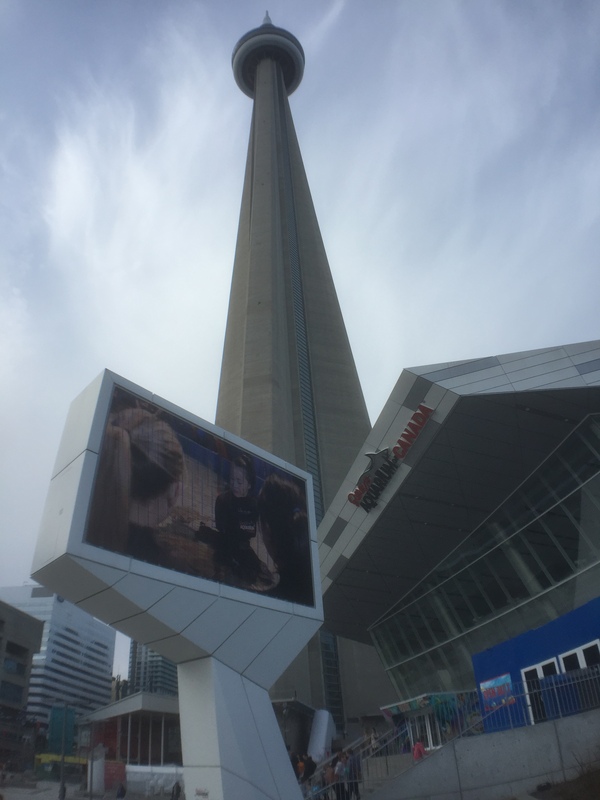 As mentioned before, 40 of us got on a bus and rode into Toronto to hang out at Snakes and Lattes and then to the baseball game. I’m a huge Blue Jays fan so this was exciting! 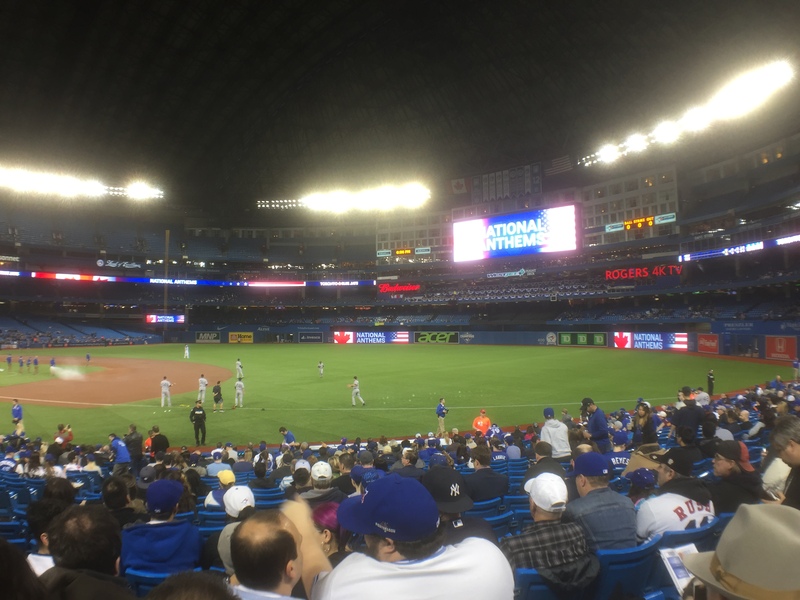 I was surrounded by Germans and Australians who had never seen a baseball game…ever! So I was able to help them throughout the game with some rules explanations. 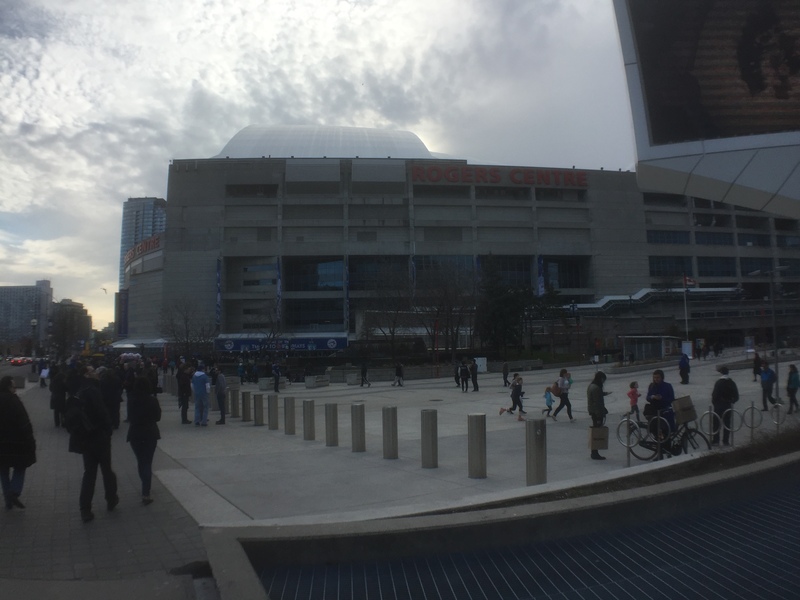 The Skydome …uh I mean, Rogers Centre! Getting ready for the game to start! All the rooms had fridges and microwaves this year so we did a grocery run when we first got there which was my breakfast and lunch every day. For dinner I had a lot of yummy Indian food as there are many options close to the hotel. We did our annual walk over to the Canadian side to have dinner at a nice wood oven pizza place. We had around 18 of us this year, with numerous designers and publishers. On another night, eight of us drove into Buffalo to eat some great meat at Dinosaur. We were well fed. 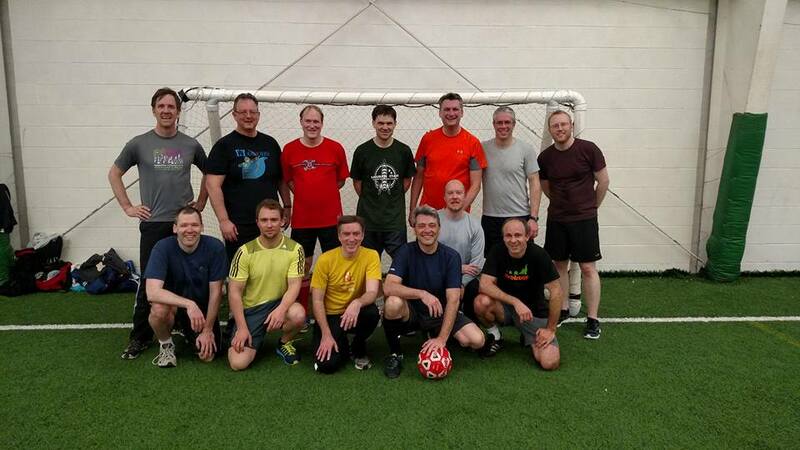 We had our largest turnout for our annual soccer game, organized every year by Richard Bethany. This year we each had a sub plus a full team of 6 on each side (half field- hey we’re old!). One of my favourite activities every year. The final ceremony started with a humourous magic act and then quickly proceeded to the prizes! Everyone that donates something, like a game to the prize table, goes into a draw and gets to take something from the prize table. It’s not just games though…there were numerous hand made options like meeple pillows, hand painted miniatures for popular games, handmade gaming quilt – plus some super hard to find games like Indonesia and Antiquity. I managed to snag Super Motherlode because it’s from Roxley Games…and they’re just awesome (they’re doing a Kickstarter for Santorini that end soon).